Help support Mike: Bookseller and you could be just like Joseph here! Check it out! 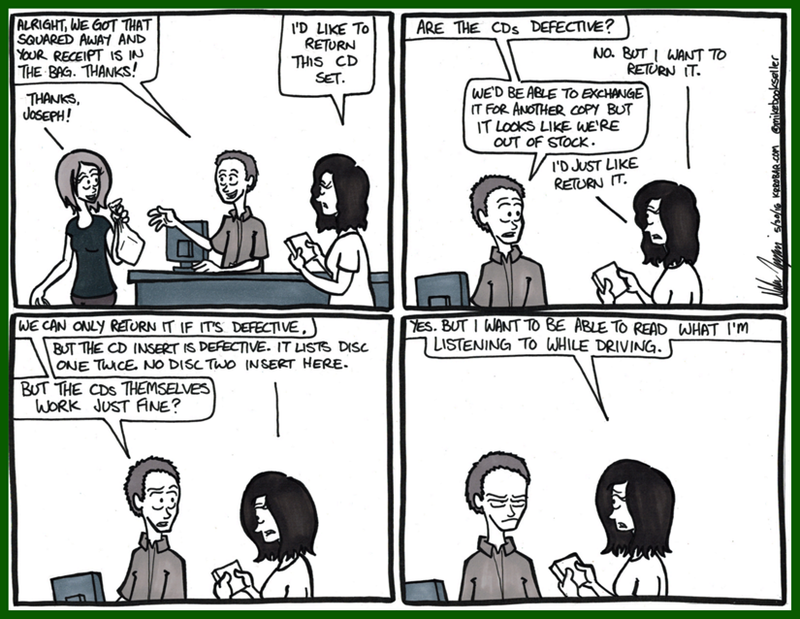 “I was working the help desk, when a lady came up and said she wanted to exchange her Double CD set for a new one. I went back to see if we had any more and we didn’t have any. I told her so, and she asked if she could return it. Now, corporate policy was that once a CD had been opened, we couldn’t accept it as a return, and I told her so. I then asked her just what the problem was with the CDs. I really want to be able to read customers’ minds just to see how their thought process works. It still baffles me how out of left field their reasons, or excuses, are. Thanks for the email, Vic! !